Mary of Angels Chapel is in the round with a soaring pine ceiling and with beautiful stained-glass windows designed by artist Laurie Biezi. The chapel holds our complete set of crystal singing bowls donated by our Director of Spiritual Deepening Services Annie Lea. 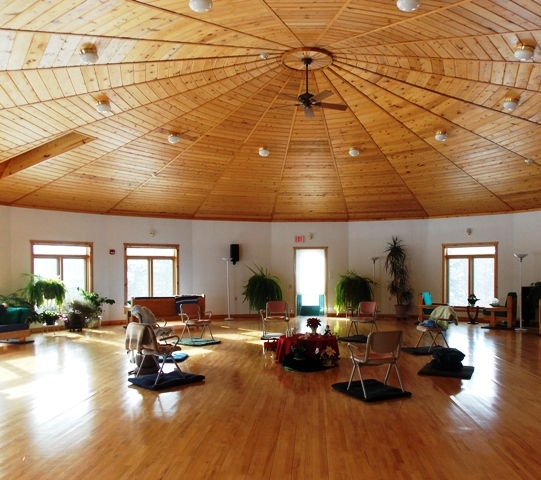 If the exquisite round hall is not being used, you are welcome to enjoy this beautiful space to meditate, practice yoga, or just relax. Our library is a first-rate collection of a wide-range of spirituality titles. There are two computer stations with printers, plus wifi. 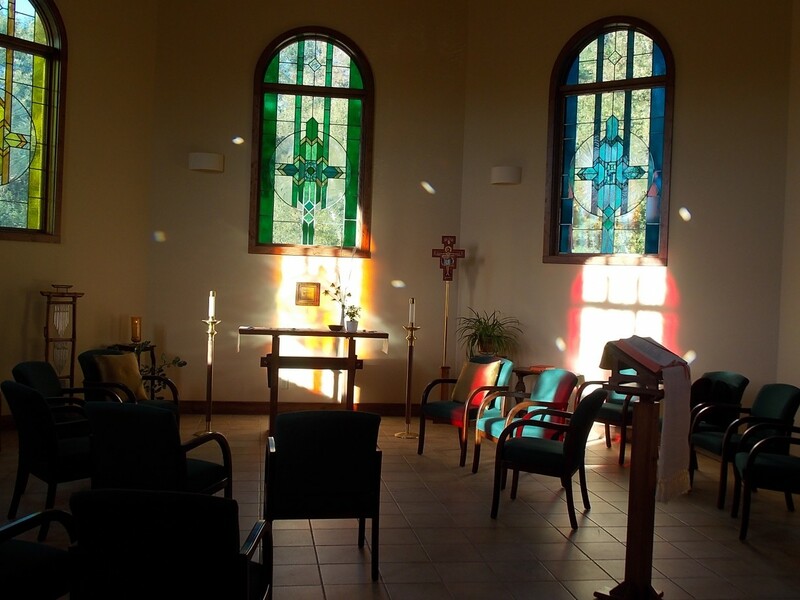 A comfortable, quiet, contemplative space for reflection with lots of morning sun. You will also find a telescope, donated by our Executive Director Russell King, for star-gazing as weather permits. It’s small but mighty. We stock a wide range of subjects on spirituality. 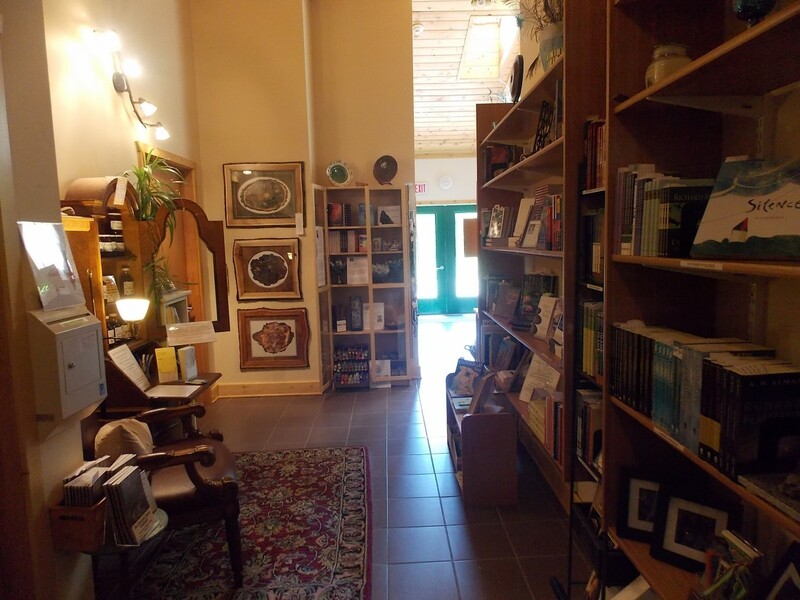 In addition, we carry beautiful handmade bookmarks, original art work, handmade jewelry, and contemplative items, as well as a choice of journals and notebooks, colored pencils, incense, and hand-crafted soaps. Spirit Jewel is located along the corridor on the way to the library and chapel. A comfortable chair and lighting allow for browse and sit sessions. Fresh books arrive every week or so, and our free books are replenished monthly. Spirit Jewel offer books on Christian mystics, contemporary Buddhism, contemporary spirituality, Jungian dreams, science/eco-spirituality, First Nations, yoga and body awareness, St. Hildegard of Bingen, writing as spiritual practice, mandala and intuitive arts, and many other topics, and a children’s section for books to enjoy with and to inspire the little ones in your life. The center offers marked trails for hiking briskly, slower contemplative walking, meditation, cross-country skiing, and snowshoeing. One stretch of our trail is now a board-walk for walking in wet weather.